Arsenal will not go into debt to finance the signings of new players, Ivan Gazidis has said. Instead the club has a "very sophisticated" way about signing players so that the club doesn't stretch itself. The chief executive said that making sure the club didn't rely too heavily on the financial support of fans was also part of the thinking when signing a new player. 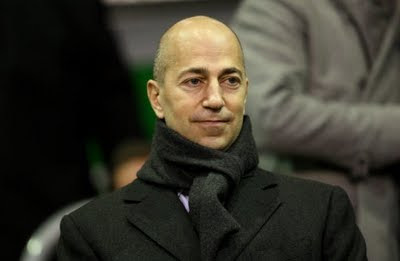 Gazidis said he and manager Arsene Wenger were "very active" trying to complete deals for players behind the scenes. "Ultimately we spend all the money we generate. Where you have a limited budget, you know what the budget is. It is inconceivable to me that we could have a manager that would say we have this need and this need and this need and you don't have a discussion about how those needs are prioritized and which players at which price would fit those needs best otherwise we'd be left with a mess I think. "We plan in a very sophisticated way how we sign players and the financial model for that because we have to be sure that not only can we bring them into the club but that we can sustain the salary levels of our player pool over the longer term without placing excessive strain on the relationship we have with our fans from a financial stand point. "Obviously there has to be much more interaction." The CEO said he saw no benefit in excluding Arsene Wenger in the financial side of a signing and it was as much up to the manager whether he felt a price for a player was too much because it would impact on the rest of his transfer budget. Gazidis wouldn't be drawn in to revealing why Samir Nasri and Gael Clichy had not been offered new contract sooner, to prevent them from walking away on a free transfer next summer.